One for the big man’s collection; this short sleeve crew neck tee from our 2019 NSW Supporters range has a unique textured vintage style print on the chest and is stylish enough to show your support for the Blues on any casual occasion. 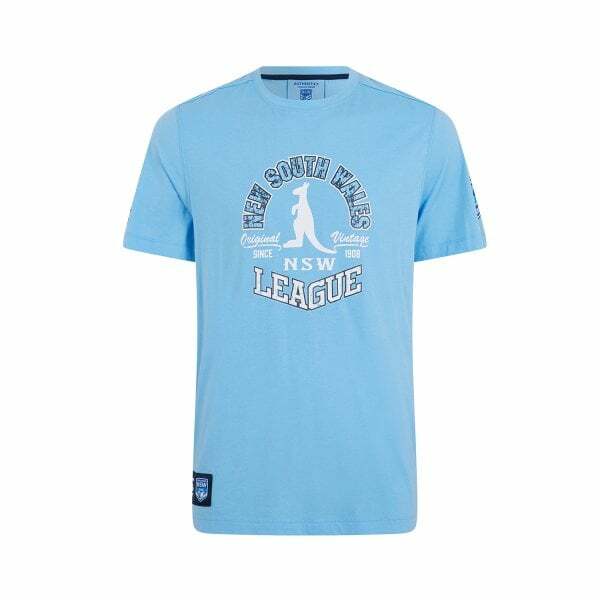 Bold enough to declare your support for the Blues, stylish enough to wear on any casual occasion; Canterbury’s Vintage League Tee from our 2019 NSW Supporters range is definitely one for the big man’s collection. A classic crew neck tee available in sizes 5XL – 6XL, it’s made with a soft blend of polyester and cotton and will quickly become a favourite in your smart casual wardrobe. It’s also Origin ready, with a striking textured vintage style print on the chest and Blues team and sponsor logos on the sleeves. Vintage supporters wear you can wear almost anywhere, available now at Canterbury.